Schöffer received his artistic training at the School of Fine Arts in Budapest and the École Nationale de Beaux Arts in Paris. He moved to France in 1936. In 1948 he began to investigate Spatiodynamisme through the construction of a series of sculptures constructed of aluminum frames and glass or Plexiglas colored sheets (in some cases mobile) whose particular design and structure produced the dynamization of both the internal spaces of the pieces and their environment, multiplying the effects of light and shadow. 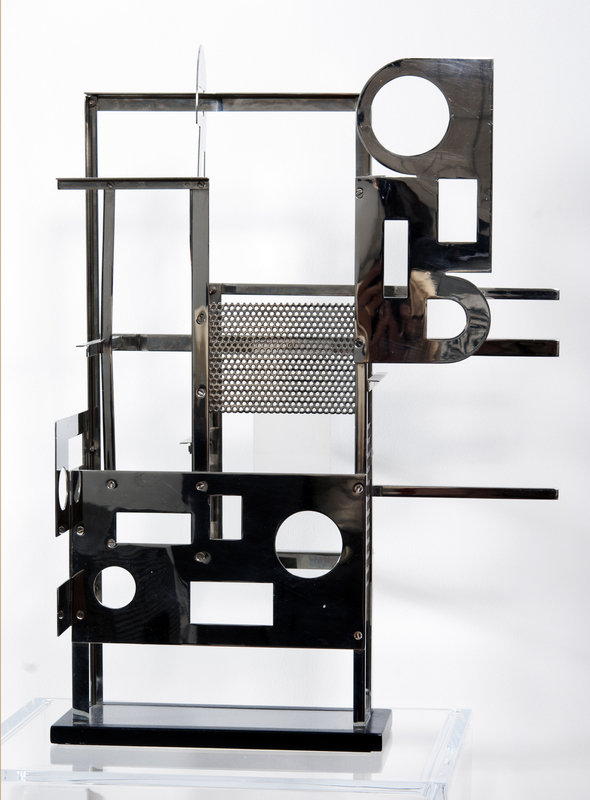 The first sculptures of this series Spatiodynamique 1 and Horloge Spatiodynamique (a clock with an electrically activated mechanism) were produced in 1949 and exhibited the following year at the Galerie des Deux-Iles (Paris). In 1954, together with composer Pierre Henry and engineer Jacques Bureau, he performed the sound work Tour Cybernétique Sonore at the Salon des Travaux Publics (Paris). For this pioneering work and for many that followed Schöffer is considered one of the fathers of cybernetic art. In 1956 he made CYSP 1, a cybernetic sculpture that used various types of sensors (photocells, microphones, radars) to react harmonically to the movement, light and sound that occurred around it. The work was featured at the Night of Poetry presented at the Théâtre Sarah Bernhardt in Paris (1956). In 1957, Schöffer’s investigations into space dynamism evolved towards Luminodynamism with its corresponding series Lux. Using the new idea, the dynamism of his sculptural pieces was deepened and amplified in response to artificial light. To accomplish this, the sculptures of the Lux series were provided with movable reflectors, filters and screens. The same year he presented his first Luminodynamic shows at the Théâtre d’Evreux (Evreux, France) and Grand Central Station (New York). In 1959 his studies led him to develop the concept of Chronodynamism. To his previous work with space and light Schöffer added the idea of the revitalization of time. This could be achieved by programing the activation, stopping and speeding of the reflectors, mirrors and various parts of the mobile sculptures that made up the Chronos series. When the effects produced by the sculptures belonging to the Lux and Chronos series were projected on screens or other surfaces they were called Mur Lumière. In 1961 Schöffer installed Tour Cybernétique, a tower 52 meters high made up of a metal structure with movable mirrors and sound, at the Palais des Congres de Liege (Belgium). The same year he produced Variations Luminodynamiques, a pioneer work that would be considered later as video art, an artistic medium in which Schöffer was a pioneer. The artist spent several years researching this medium but it was not until this work that he achieved perfect synchronicty between movement, effects, and sound. One of his most emblematic works from 1965 is Le Prisme, a synthesis of his previous research. It is a large-scale prism with walls formed by translucent screens provided with a mechanism that produces luminance and chromatic effects in non-repetitive rhythmic combinations which not only illuminate the screen but also project the images onto the surrounding space. In 1966 he presented Microtemps at the Galerie Denise René (Paris), a series of sculptures made up of black boxes lined inside with stainless steel sheets of various shapes (usually circular and helical) animated by electric motors on which lights were projected generating light and color. The purpose was to influence (enhance, modify or discontinue) visual stimuli during the fragment of a second that elapsed from the moment the ray of light entered the visual apparatus through the eyes until it reached the brain and the consciousness. In 1969 he produced Minieffet, boxes equipped with flashing bulbs and interchangeable and combinable translucent screens that the viewer was able to manipulated to produce different light and color effects. He also presented Kyldex 1 at the Hamburg Opera, with music by Pierre Henry and choreography by Carolyn Carlson and Alwin Nikolais. The show, a cyber and light-dynamic experiment that included robots, prostitutes, dancers and sculptures, consisted of fifteen sequences controlled in real time by the viewers who were given controls that allowed them to repeat, duplicate, slow down and stop the different sequences. The event was broadcast live on German television. The diversity of Schöffer’s work continued to evolve throughout the 70s and 80s. He produced Scam 1 (1973) an automobile sculpture produced in collaboration with Renault and Coggiola that drove through the streets of Milan and Paris. In 1977 he ventured into fabric art creating Murlux 1 (a luminodynamic tapestry produced from a web of plastic tubes) and Metap 1 (metal mat), presented at the Tapestry Biennial in Lausanne (Switzerland). At the same time he continued to add to the sculptural series he started in the 50s. Sculptures sometimes reached monumental dimensions as in Spatiodynamique 17 (Hirshhorn Museum and Sculpture Garden, Washington DC, 1968), Chronos 14 (Embarcadero Center, San Francisco, 1974), Chronos 15 (Bonn, 1977), Chronos 10 (Musée de la Sculpture en Plein Air, Jardin Tino Rossi, Paris, France, 1980) and Lux 16 (Autoroute Pont-d’Ain, France), among others.